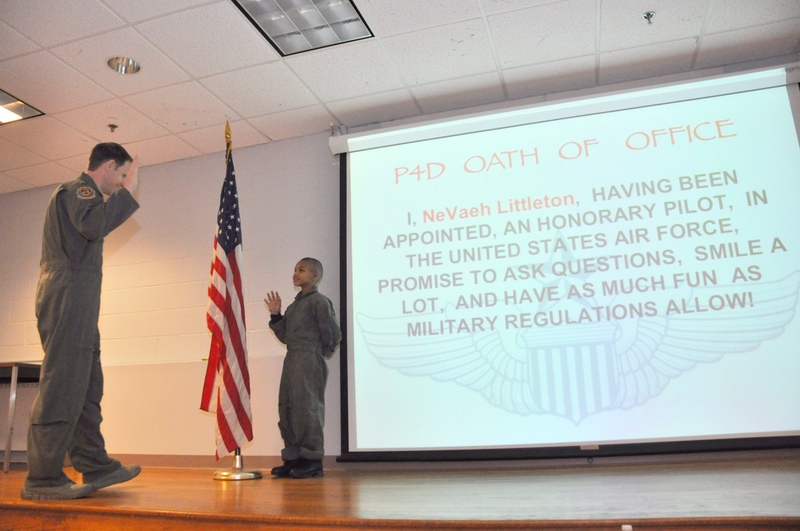 Ne’Veah Littleton takes his Pilot for a Day Oath of Office from his wingman, Capt. Brad Lampel, a 201st Airlift Squadron mission pilot. Ne’Veah was appointed as a pilot for the Pilot for a Day program at Joint Base Andrews, Md., Nov. 22. (Staff Sgt. Katie Spencer/Air Force). They say it’s the little things in life that make a big difference. Ne’Veah Littleton, 8, was made a pilot for life through the “Pilot for a Day” program at Joint Base Andrews, Md., on Nov. 22. Littleton was diagnosed in April with stage four Diffuse Intrinsic Pontine Glioma, a tumor on the brain stem, according to an Air Force release. The average survival of children diagnosed with Diffuse Intrinsic Pontine Glioma, or DIPG, is approximately nine months. Staff Sgt. Katie Spencer writes that members from Andrews, along with partners from the community, joined together to treat Littleton like a world-class pilot: his day began with a special P4D initiation, taking an oath of office in front of a crowd standing at attention at the 459th Aeromedical Evacuation Squadron auditorium. Littleton – along with his wingman, Capt. Brad Lampel, 201st Airlift Squadron – rode in an F-16 fighter jet simulator and sat in a parachute harness at the 121st Fighter Squadron. They also toured a KC-135, received a military working dog demonstration, ate lunch on the C-40 aircraft used by the First Lady, shot water out of water cannons off the fire truck, and even got to call the tower to request clearance as they taxied onto the runway in a C-38 aircraft. In addition, the team was able to sit in a helicopter from the Maryland State Police, the release says. “I am his wingman for life, so we will always be in contact,” Lampel said in the release. “This is all very memorable. It’s the greatest thing to happen to me this year – a highlight for sure,” Lampel said. After all the stops of the day, Littleton and his family headed back to the 459th Air Refueling Wing for a special ceremony. Read more about Ne’Veah Littleton and his story here.